Can you believe this is January in Portland? I took this picture today. We do get these cold, sunny days, but it sure seems like more of our winter days are dark and cloudy. It has been remarkably dry so far this winter, which worries me a bit. There is no scientific data to back up my worries, it is more like karma: we are going to get some 35 inches of rain each year. Will come in winter like it should or we will get it later, in spring and summer when I want the ground to dry out so I can plant? But really, it is too early to worry. The rains will come when they come (next week?) 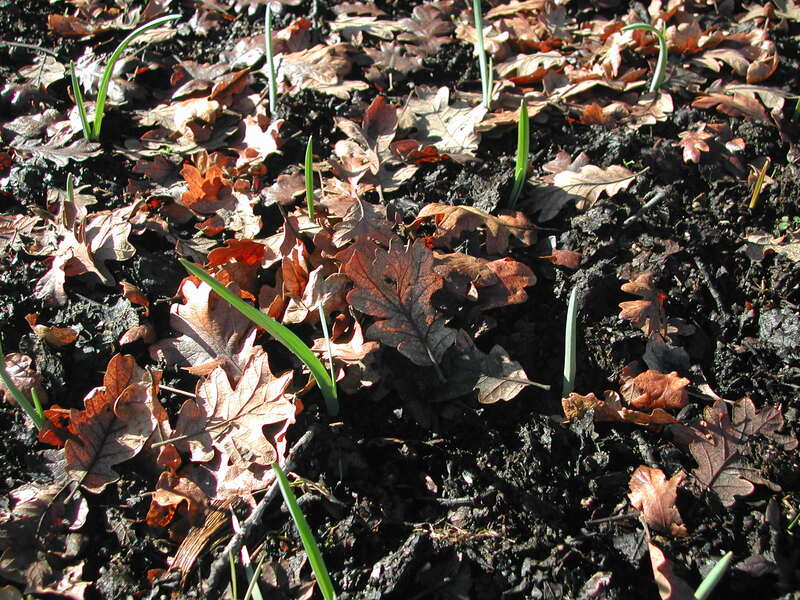 and there will be some opening between the showers to get everything planted. The girls have been free ranging since mid-November now. 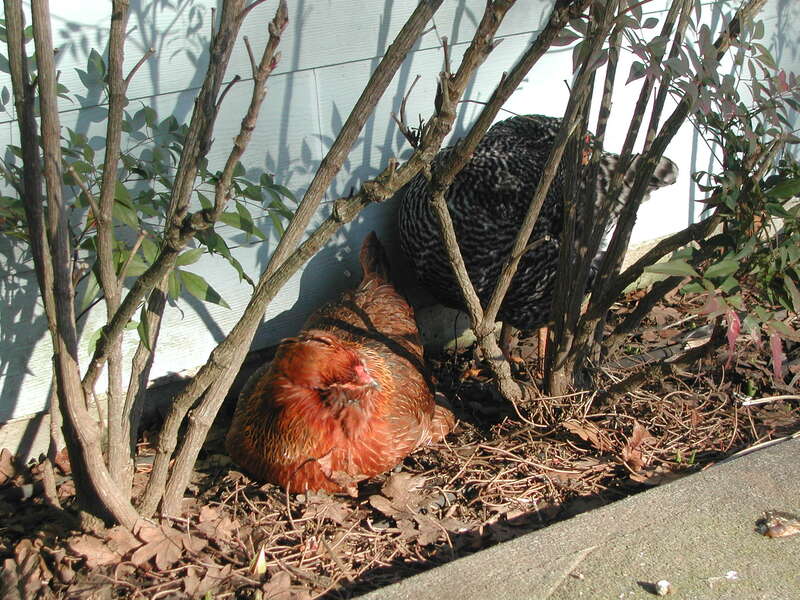 On the really cold days, they tend to hang out near our front door, under some heavenly bamboo next to the garage. It is one of the warmer places on a cold day, and it offers protection. I like to be able to look out the front windows and see them there, though I like it even better when I see them scratching around in the vegetable beds. On a sad note, there will be no employee of the year this year. Last year’s winner, Medium Girl, died in December. The week before she died, she was out working with me as I finished cleaning up the bean beds. She was snapping up worms, slugs and other bugs right and left. She even ate two little frogs and it takes some time for a chicken to eat a frog. I am not sure why she died, but I suspect she just wore out. Out of respect, I canceled this year’s award. The garlic is showing up. The work for 2012 has started. 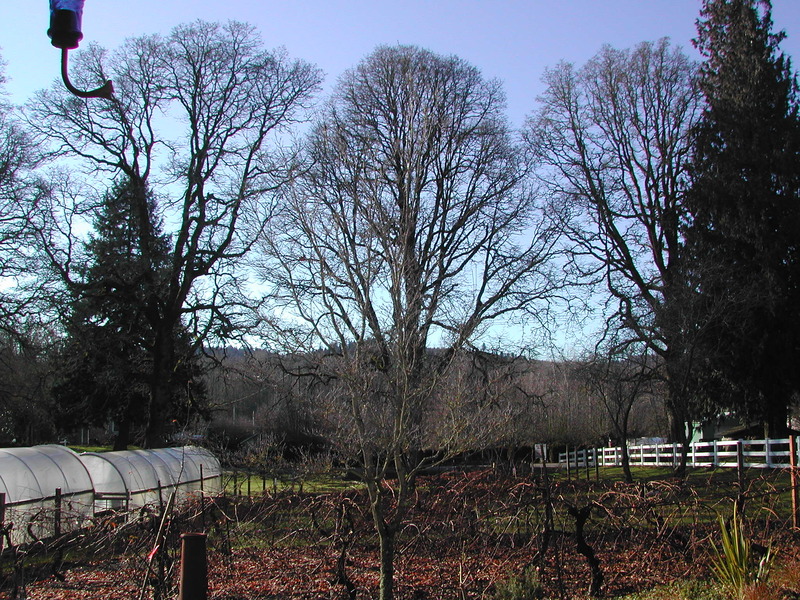 I attended the North Willamette Horticultural Society Meeting: Organic Crops Section on Tuesday this week. There were some interesting presentations. One fellow from Canada presented some research on the benefits of using compost on berries. He was preaching to the choir, but I like seeing the research that validates organic methods. I have a 10 week class starting tomorrow on the business side of farming and The Small Farms conference in February. Lots of good things to learn. 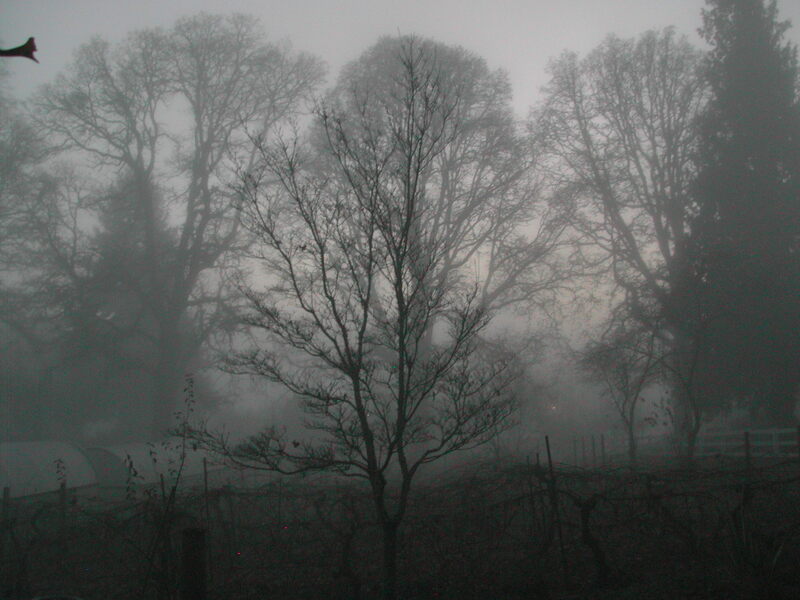 A foggy late afternoon in December: more to come? Planning is underway. I welcome your feedback on vegetables and varieties that you especially liked or ones that you could do without. Planning will be followed by seed ordering, reading and research, and getting everything cleaned up to start seeds in February. Are there ever enough hours in a day? Even in the dead of winter, time flies.